Big and blocky looks add to the ute's appeal. 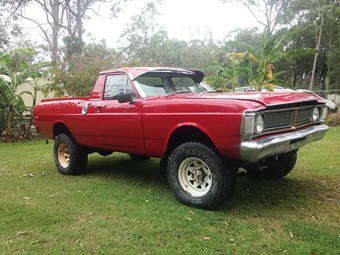 Gold Coast-based Lloyds Auctioneers and Valuers is establishing a reputation for finding tasty classic and muscle cars around Queensland and putting them under the hammer Australia-wide with their blended online and physical bidding process. Its next Classic, Muscle and Barn Finds auction is Saturday, 19 November, with 35 lots covering a wide range of periods and interests from 1922 Ford Model T to 2004 Lamborghini Gallardo. Also on offer is a trio of Holdens, starting with a 1972 LJ Torana GTR which has recently undergone a partial restoration including panel and paint work in stunning metallic lime green along with a new interior, a 1975 HJ Sandman panel van which claims to be one of only nine models produced in this colour and is being offered with no reserve, and a 1970 HG Brougham which is described as very original. For Ford fans the Royal Maroon 1969 Torino Talladega will be one to watch with only around 750 reported to have been made, along with a very original-looking 1966 Lincoln Continental convertible. Other potentially smart buys include a near-new 2016 Mustang V8 and a 2006 Bentley GT Continental Flying Spur which, given its repaired write-off status, could see a hammer price much lower than the circa $85-100k price these cars currently command on the used market. For those on a budget, consider the 1957 MG Magnette, 1975 Chrysler New Yorker (with a 440ci V8) or even the 1988 C4 Corvette.